Detox Drink: Coriander Carrot Juice! Carrot is one of the powerful food that cleanses liver. 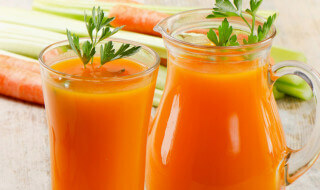 It is an excellent source of carotene which makes it an integral part of detoxifying diet. Coriander Carrot juice gives health benefits of carrot along with the refreshing smell of coriander leaves makes it a perfect detox drink. Keyword Detox Drink: Coriander Carrot Juice! Get a juicer or blender and blend everything together. Strain if required. Add little black pepper to taste. Also, try this healthy Spinach and Mushroom Omelette Recipe!